The Aframax ‘SCF Baltica’ (117,000 dwt and ice class 1A-Super (Arc5), owned by the Sovcomflot (SCF) group, arrived at Ningbo on 6th September. This successfully completing the tanker’s voyage transporting 70,000 tonnes of gas condensate (delivery from OAO Novatek), from Vitino and Murmansk, along the Northern Sea Route (NSR). It took about 22 days for the ship to sail from Murmansk to Ningbo, which even taking into account that the voyage was experimental, meant it was twice as fast as the traditional routes for ships navigating via the Suez Canal, SCF said. 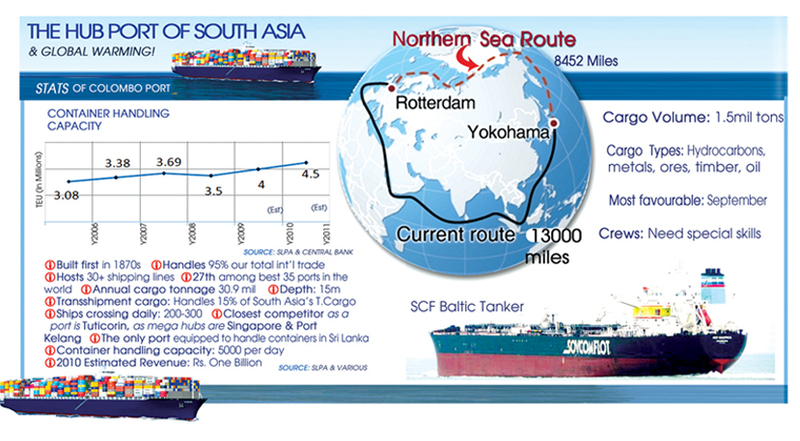 The ‘Arctic Passage’ suddenly throws itself open: Will Sri Lanka’s strategic advantage end? As you read this- right at this moment (September 1) , unknown to most of us, a historic journey is taking place -in the deadly, freezing seas of the Arctic. 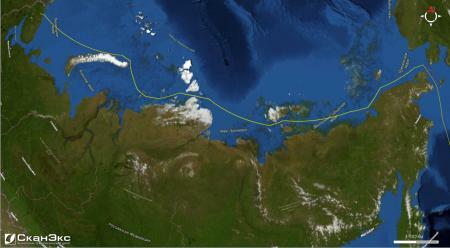 On August 30, a large tanker called SCF Baltica has crossed the once unimaginable Arctic Circle to deliver 70,000 tons of “gas extract” (condensate) all the way from Russia to China. The first time a tanker or a ship of a considerable size has successfully crossed the ever frozen “Northern Sea Route” (NSR). NSR is known for centuries as the “Northeastern Passage” and dreamed by all major shippers ‘wanting to navigate it.’ The successful tanker SCF Baltica is now continuing towards its final destination ‘Ningbo Port’ in Zhejiang Province, China having passed the NSR and is expected to call at its discharge port ‘Ningbo’ someday in mid-September.Shipping & Logistics experts of Sri Lanka–over to you! 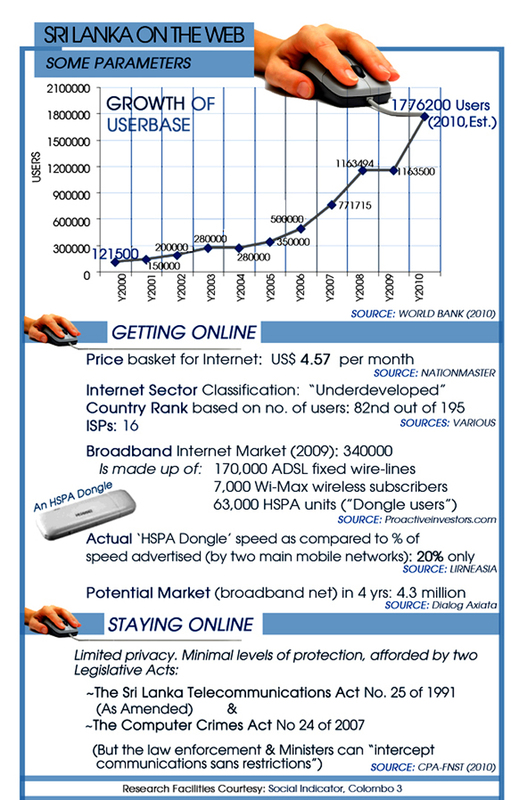 Sri Lanka’s 1.6m Web user freedom threatened, are we to just go offline? An Internet Freedom of Expression (IFoE) study by Colombo based Centre for Policy Alternatives and Friedrich-Naumann-Stiftung für die Freiheit –Colombo (FNST) released on August 2 calls Sri Lanka to take immediate steps to legislate for broad privacy protection . It also wants service providers to provide clear privacy policies. The CKE gets you there in 50 minutes. Is it sustainable with a partial toll? Last week, Sri Lanka has secured US $500 million from Asian Development Bank (ADB) for the much needed Colombo-Kandy Expressway (CKE) linking of course, Colombo and the central hill city of Kandy. Roads, the backbone of our transport sector, account for 92% of freight & passenger traffic in Sri Lanka. We have a total road network of around 100,000km. Of this, 11000 km are considered as national highways, classified as ‘Class A’ and ‘B’ categories. There are 25 motor vehicles per 100 persons (est. ), with 21067 million passenger-km reported. The road density in Sri Lanka stood at 1.6 km of roads per every square km (2009) which is higher compared to that of other countries in the region, according to the Central Bank. 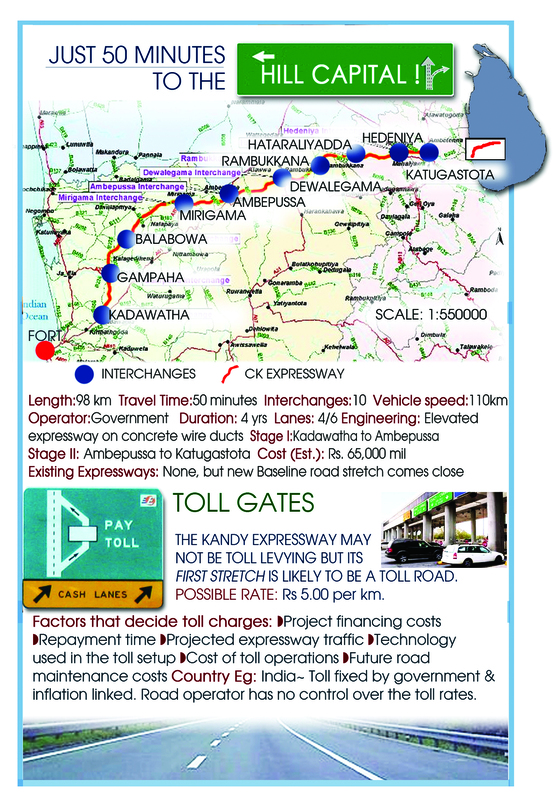 The current Colombo-Kandy trunk road, called as A1, was Sri Lanka’s first modern road. Taking 11 years to complete, it was endowed to us by the British in 1932. The current distance between the two cities is 115km (72 miles) and the ‘A1’ stretch often results in severe traffic congestions, especially for oncoming traffic towards the capital. Sri Lanka’s Ayurveda physicians claim ‘promising’ Dengue antidotes; Are we game? 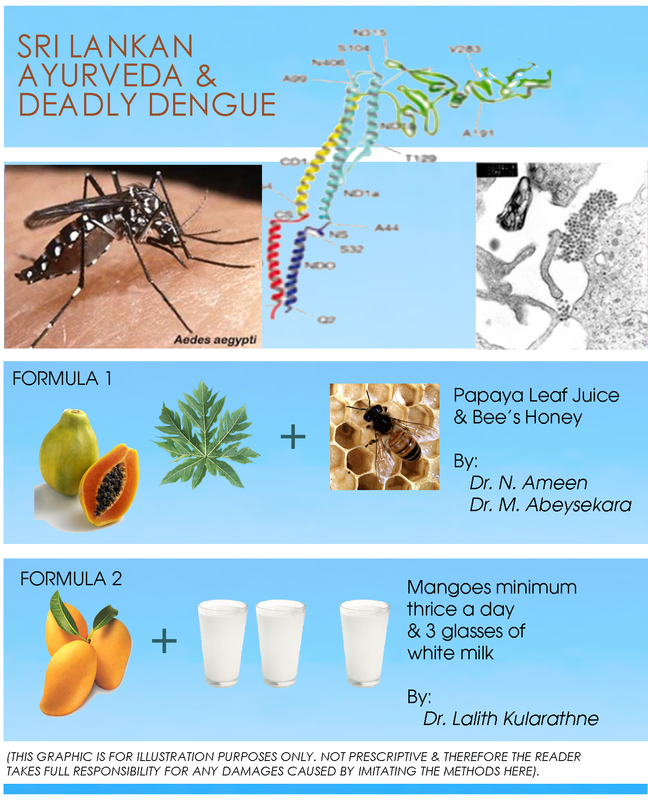 Amidst increasing threat levels of the dengue epidemic in the country, two ‘herbal’ antidotes for the deadly mosquito bite are now claimed in Sri Lanka. The dengue problem is reported across the country, but is mostly concentrated in the Districts of Colombo, Gampaha & Kandy. Latest statistics show that in the period of January 1 to July 14 this year, 20647 cases of dengue have been reported. The number of deaths: 149! There are no licenced vaccines at present against dengue and currently, there is also an ongoing effort to develop a dengue vaccine by Australian & Thai researchers (of Queensland University of Technology) but not before 2014. SriLankan Airlines is the national flag carrier of Sri Lanka, a full service airline, and is one of Asia’s leading airlines. It has won the Best Airline Turnaround of the Year 2004 from Centre for Asia Pacific Aviation and also the Best Airline in South Asia (3 consecutive times) from Travel Trade Gazette. As of April 2009, the airline has a route network serving 28 destinations (51 through codeshare) in 15 countries (28 countries through codeshare). SriLankan’s fleet comprises of 13 Airbuses and two AN12 freighters. SriLankan Cargo, (two dedicated freighters) through its AN12s operates to 50 destinations in 28 countries in Europe, the Indian Sub-continent, Middle East, Far East and South East Asia. Nevertheless, according to recent reports, revenue has dropped only by 7% (Rs. 5.8 Bn) during the year compared to last year, but Net Profit after Tax has dropped by 302%. Obviously the revenue drop due to global down turn would not be the main contributing factor. Cost of operation has increased by 12% making cost to revenue ratio 94% to 113%. As the US economy went to recession in the middle of the financial crisis the US House Speaker Nancy Pelosi, at a recent Capitol Hill news conference announced triumphantly that a ‘stimulus package’ is coming. “Tens of millions Americans will have a check in the mail. It is there to strengthen the middle class, to create jobs and to turn this economy around.” The plan would send checks of $600 to individuals and $1,200 to couples who paid income tax and who filed jointly. People who did not pay federal income taxes but who had earned income of more than $3,000 would get checks of $300 per individual or $600 per couple” she said. The stimulus package is aimed at re-energising the economy back to its feet. But economists may not necessarily agree that the ‘package’ as it is, alone would be sufficient. To understand this, one needs to understand the key to short term macroeconomic baheviour, simply called as Business Cycles. Short term fluctuations in macroeconomic output, employment and prices are called business cycles (BCs) resulting the recurring expansion and contraction (leading to recession) of the national economy. Expansion is the normal state of the economy; recessions are rare and brief but are the defining characteristic in a business cycle. The dominant macroeconomic model where BCs are closely watched is the free-market enterprise system. 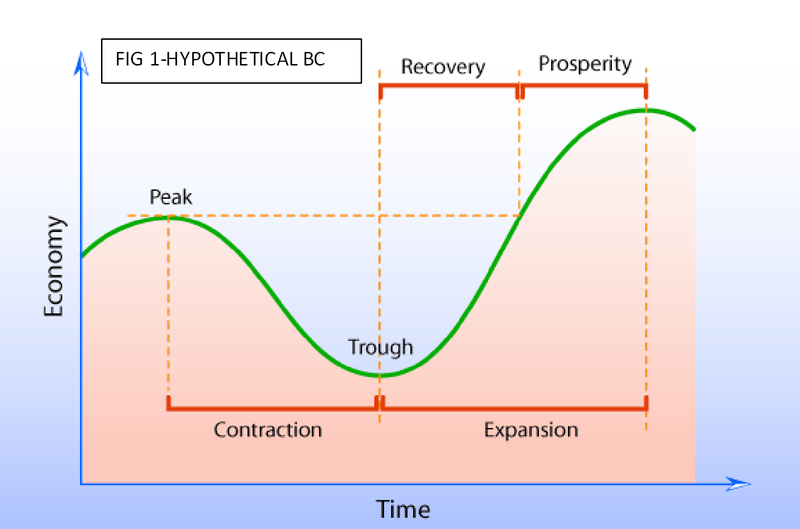 “Business cycles are a type of fluctuation found in the aggregate economic activity of nations that organize their work mainly in business enterprises. The BCs influence actual GDP (production) rather than the potential GDP. Actual GDP often changes sharply from year to year. The “quarter to quarter growth in Real GDP” as shown by the US Bureau of Economic Analysis clearly indicates the graphical trend in decline in GDP and starting of the recession in the Q4/2007, where a negative GDP growth is reported. A stagnant trend existed throughout the Q1 of 2008. The “US Monthly GDP-Latest Estimates” shows even more clear (zoomed in) view of the monthly GDP scenario clearly showing the negative GDP trends (circled), namely Oct -2007 and Nov-2007. As stated, the broadest indicator of the three indicators is unemployment. Unemployment, stands for the percentage of labour force that is unemployed in the economy. BCs affect on unemployment rates as well. The table and graph (next page) clearly show the rising trend in the unemployment levels. The pattern is clearly discernible; From Jan-2007 to Nov 2007 it was growing at a slow rate; the second phase begins from Dec 2007 onwards where a steady climb in the rate is clearly evident; this is the recessionary period. It is important to note that the importance of unemployment rate is not limited to being an ‘recession indicator.’ Some strongly believe that the key to recovery is here – rather than the proposed stimulus package (discussed below) by the Bush Administration. Skepticism is high on refinancing and liquidity plans. WILL THIS CAUSE THE MULTIPLIER EFFECT? The multiplier theory was suggested by John Maynard Keynes as a tool to help governments to achieve full employment. It measured the amount of government spending for a level of national income that would prevent unemployment. The more the need for consumption, the greater is the multiplier effect and Keynes expected the government can influence the size of the multiplier through changes in direct taxes such as a cut in the basic rate of income tax will increase the amount of extra income that will be spent on further goods and services. In the 2008 Recession, instead of Keynes “Tax Cuts” approach (1), the US government appears to directly handout lump sums to US households in the form of a “Stimulus Package” at a cost of $ 146 billion. However, opinion surveys in 2008 March found that upto 87% of the public plans to either invest their tax rebates or use it to pay down debt. With the steady rise of inflation post March, this percentage can only grow upwards. In fact, if more than 80% of the US public are unwilling to spend their tax savings, will they even spend what they receive on a check? Thus, the “checks in the mail” are less likely to be used for spending and thereby, to the economy is less likely to be stimulated. Therefore, any calls for the multiplier effect should be viewed with high skepticism. Inflation, in which the price levels of economy increase, affects the purchasing power, eroding power of money. Historical evidence shows that rapid price changes disturb the economic decisions of companies and individuals, people lose their confidence in currency, slows down the economic activity and increases unemployment. The United States has lost 760,000 jobs in the past nine months, according the US Bureau of Labour Statistics estimates. The graphs below illustrate how the inflation rates soared from end of Q4 / 2007 onwards as the US economy entered recessionary cycle. It is incorrect to say that one can correctly judge the trigger-exact reason for a recession –especially for one that is as complex as the 2008 Recession, where a host of multifarious and interwoven factors have been at play. It is strongly believed that the increase in consumer debt to about $ 943 billion, is the strongest contributory factor (per capita debt: $3,112.19). This consumer debt growth, in turn, has its roots in the last US recession in 1992. In its aftermath, the Federal Reserve artificially expanded credit and investment, but was not backed by increase in voluntary household saving. The instrument from this expansion has been transferred to the market by the banking system as newly created loans at extremely low interest rates. This fueled a speculative bubble in the shape of a substantial rise in the prices of capital goods, real-estate assets, and the stock market, where indices soared. However, this bubble is not based on voluntary savings (healthy for economy) but artificial expansion (unhealthy for the economy). Entrepreneurs use these artificial funds for investment but with the pretentious confidence that their funds are from savings. Nevertheless, Nouriel Roubini, president of Roubini Global Economics had foreseen the US Recession back in August 2006. His diagnosis: “The decline in investment in the housing sector and inventories that are not moving.” He highlighted US National Association of Realtors data that stated “sales of existing homes fell 4.1% in July, while inventories soared to a 13-year high and prices flattened out on a year-over-year basis”.